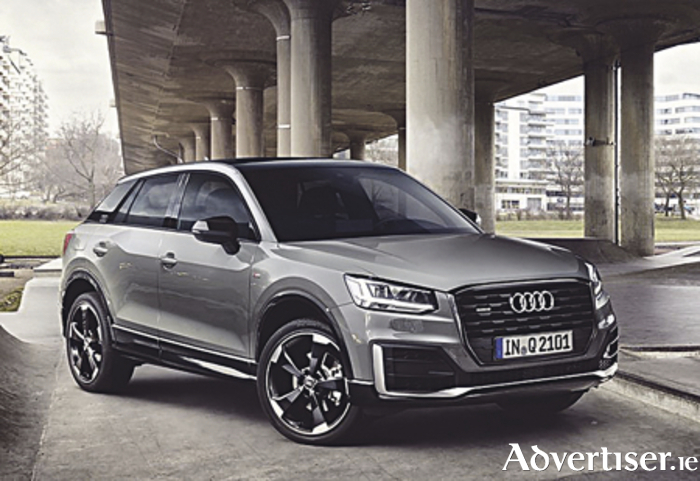 The Audi Q2 Edition #1 features an exclusive quantum grey paint finish, black and Manhattan grey exterior details, 19-inch wheels and a long list of standard equipment. The Audi Q2 Edition #1 wears the look of the S-line exterior package with sporty bumpers and sills, as well as the distinctive diffuser. Unique to the special edition are add-on parts in Manhattan grey in the lower area of the body. They emphasise the robust character of the compact SUV. The black blade on the C-pillar, which sports the four rings in white, and the black exterior mirror housings are further features exclusive to the special edition. The same applies to the new paint finish - quantum grey. Depending on how the light strikes it, the dark tone is either completely homogeneous or it creates an intense play between light and shadows. The Audi exclusive titanium black styling package sets accents in the area of the Singleframe grille and the bumpers. The anthracite black and 19-inch wheels with a five-arm rotor design originate from Audi Sport. Standard LED headlights and rear lights – the latter with dynamic turn signals – round out the technologically upscale look of the Audi Q2 Edition #1. In the interior, the special edition impresses with lavish appointments from the Audi design selection: height-adjustable sport seats, a leather-covered multifunction sports steering wheel, leather package and illuminated aluminium door sill trims with the S emblem are standard. The seats are covered in a combination of fabric and leather in black and amaretto; the headlining is titanium grey. At night, the ambient lighting package attractively highlights the interior. LED light guides backlight the sculpted trim strips on the instrument panel and on the centre console. They shine with a subtle, homogeneous light in a choice of ten colours the driver can set via the MMI. The Audi Q2 Edition #1 is available with all engine variants. Order books open to Irish customers this month; pricing will also be announced at that time. The special edition will be available at dealerships nationwide later on this year.